I like to see the progress and movement we are experiencing with competency-based learning. In 2011, I started Skills Based Approach; I do not think there is much difference in what the phrases represent. A key aspect of this type of learning is an assessment – evaluation or estimation of a person’s ability. It is intriguing to play a game, complete a project, or take a test and through an assessment get an accurate portrayal of a competency – like taking the SAT, GMAT, or LCAT, which produces a score of a capability in a field of study. But these standardized tests have a similar shortcoming in that they do not consider the context behind the knowledge –experiences. For this reason and others, I think there is significant value in tracking the successful completion of learning tasks – a record of learning. An assessment might be included within or after a task or series of tasks. I am fortunate to have had two tremendous mentors in my life. My experiences had such a powerful, lasting impact on me, I feel compelled to share my stories and promote mentorships. I created this graphic without doing any research or reading articles on mentoring, this was based on purely personal reflection of my experiences. Recently spoke with an education administrator about getting education standards on learning labels; I got a response “Ahhh”, an unsaid: How do you do that? Well, this video is my answer. 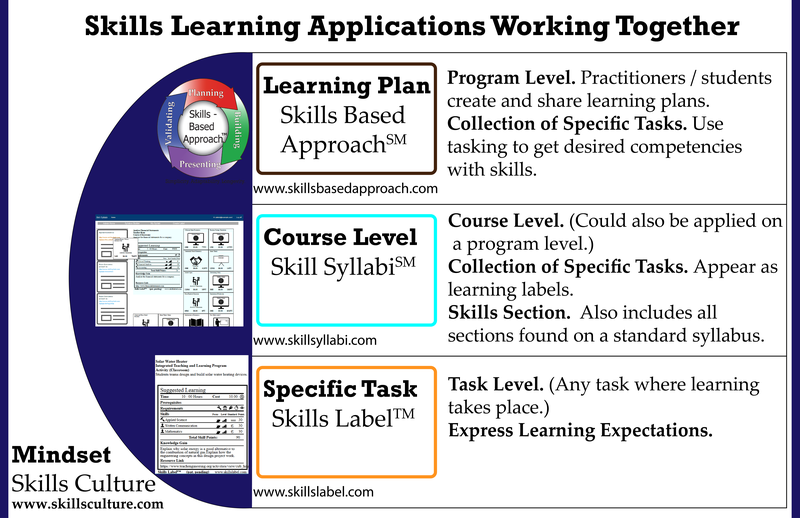 With learning labels it is possible to start with skills and get standards or start with standards and get skills. This video demonstrates the latter. It is also worth noting that the Skills Label framework is meant to work with any set of standards. Currently, it works with Common Core and NGSS. There is an interface where a practitioner can setup their own standards (called ‘dynamic standards’). Of course, I would be happy to work with you to get them up as well. Thought of the Skills Based Approach SM (“SBA”) methodology in 2011 as I was creating a platform for personal websites. Early on, I recognized skills as a critical element of a personal website. In an abstract way, I see much of the content behind a personal website as presenting and validating skills (two stages of SBA). There are other elements. (For them, there is a framework – Online Personal Brand: Skill Set, Aura, and Identity.) I still feel strongly that most individuals should have a personal website for credentials and signaling skills. I hear the remark: “So these Skills Labels, they are like nutritional labels but for learning (education)”. As I made clear the inspiration did not start with a nutritional label. Though later it had some influence. A nutritional label is a highly effective standard display, it: reads well – understandable to children to adults, informs, creates uniformity (measurements), and aids in making a basis of comparison. And these are also target attributes of learning labels. Some recent trends and highlights. Explosive growth in online learning platforms. The market will increase from $107 Billion in 2015 to $325 Billion in 2025. Skills Based Approach is well suited for a digital classroom. (Higher) Skills Gap for jobs requiring a college degree. Employers say students do not have the required skills. According to a Gallup survey: companies 33% disagree and 34% are neutral to the statement higher education graduates have the skills my ‘business needs’. (Middle) Skills Gap for jobs requiring less than a college degree. According to the National Skills Coalition’s analysis of BLS 2015 data, “middle-skill jobs account for 53% of United States’ labor market, but only 43% of the country’s workers are trained to the middle-skill level”. New programs to build skills more effectively and efficiently. There are: extended education programs where schools are aligned with companies (like P-Tech); boot camps (such as coding camps); traditional and new-age apprenticeships; micro-credentials and nano-degrees; and direct paths to certifications. Competency based learning programs. Many higher education institutions are transitioning from degrees based on credit hours to competencies. Progress with Common Core and NGSS standards in K-12. Learning standards create transparency and anchor learning expectations. Most states have adopted Common Core; some have replaced them with their own variant. Regardless, states are adopting learning standards based on foundation skills. Gamification – learning by applying skills- is more common in classrooms and offices alike. It had a market value of $2 billion in 2015 and is expected to reach $20.9 billion in 2026. Badging. Students and professionals are using digital badges to validate their skills. Like in higher education, high schools are increasingly playing an active role in ‘workforce development’. A primary goal remains preparing students for higher education: two and four year degrees. Although there is a recognition of alternatives: apprenticeships, boot camps, microcredentials, and training programs. According to the survey, thirty-five percent of school districts are partnering with employers who ‘recruit students directly out of high school into full-time jobs’ and seventy-three percent of school districts are ‘partnering with area businesses or institutions to help promote career and vocational training’.